Chapter History — Alpha Phi Alpha Fraternity, Inc. 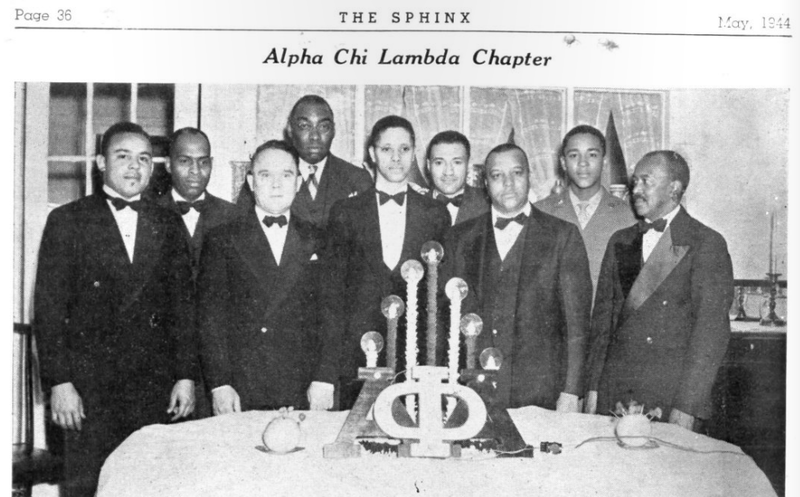 The Alpha Chi Lambda Chapter of Alpha Phi Alpha Fraternity, Inc. was established in the mid-1930s, when the few Alpha Brothers in Augusta, each engaged in a professional or business career, longed for that fraternal bond which was embodied in their lives. The initial step leading up to this reality took place in 1928. 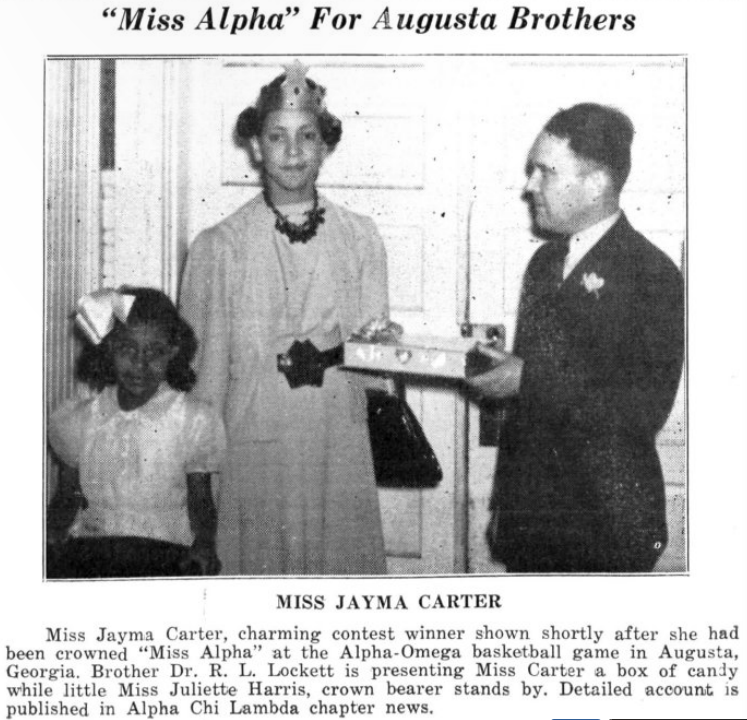 At that time, the Augusta area was home to a group of Brothers, initiated into Alpha through various college and alumni chapters, desirous of making a difference in their community and rekindling their fraternal spirits. These men met at the Tastee Shoppe on 9th and Perry Avenue with the idea of organizing a Graduate Chapter. Present at that first meeting were the following Brothers: Mr. Artemus Murray Carter, Treasurer of Pilgrim Health and Life Insurance Company; Reverend Augustus C. Griggs, a teacher at Haines Institute; Dr. A.E. Hill, a Pharmacist; Mr. Solomon M. Jenkins, Manager of the Pilgrim Health and Life Insurance Company; Dr. Robert L. Lockett, Dentist; Mr. Lawrence D. Perry, Manager of the Atlanta Life Insurance Company; Professor John M. Tutt, a teacher, Athletic Director at Haines Institute, and 2007 inductee to the Georgia Sports Hall of Fame; and Dr. L.W. White, a Dentist. It should also be noted that Mr. Artemus Murray Carter went on to help found the Alpha Mu Boulé on January 28, 1963 with Mr. Solomon M. Jenkins as one its charter members. The idea of starting a Graduate Chapter in the Augusta area was whole-heartedly agreed to by the gathering, and the first step toward accomplishing this goal was the organization of The Alpha Club, with the following officers: L.D. Perry, President; A.M. Carter, Secretary; S.M. Jenkins, Treasurer; and Reverend A.C. Griggs, Chaplain. The immediate objective was to live up to the ideals of Alpha Phi Alpha Fraternity, Inc. and at the same time introduce themselves to the Augusta community by participating in, and providing programs for the public. The Club met monthly at either the Tastee Shoppe or in a married Brother's home. At the end of the business session, they would discuss current events of local and national interest, or schedule a Brother to speak in the area of his profession or on any subject for the good and welfare of the Club. This was followed by a social hour, at which time they enjoyed a delicious meal hosted by a single Brother when at the Tastee Shoppe, or by a married Brother when in his home. Under the leadership and moving spirit of President Perry, the Brothers applied to the National Office of Alpha Phi Alpha Fraternity, Inc. for approval of a Chapter in Augusta in the early part of 1935. The request was approved, and the Chapter was given the name Alpha Chi Lambda. The date of the chartering service was set for Saturday, April 27, 1935. This affair was a grand and glorious occasion, with then-Southern Region Vice President, Brother Charles W. Greene, responsible for performing the chartering ceremony. After the ceremony, the Brothers went to the Tastee Shoppe with their wives or sweethearts for a full course dinner and entertainment. Brother Griggs passed away on December 4, 1952 and the Chapter decided to try and purchase the deceased brother's house in early 1953. The Georgia Railroad Bank Trust Company was the Administrator of the estate, and by this time the Deed to the house was in the names of the only two heirs of the deceased. The Administrator and heirs agreed to sell the house for $5,500.00. The 1025 12th Street house was purchased and a Warranty Deed for it was issued on September 3, 1953. The Alpha House (named the A.C. Griggs Fraternity House) became the first Fraternity house in Augusta owned by black Brothers. The chapter has been the recipient of many awards, proclamations, and plaques for its service projects, devotion to the aims of the fraternity, and its commitment to the uplifting of all mankind. The chapter has also been host to numerous State and District Conferences as well as two of the largest Southern Region Conventions held in the last ten years: the last convention of the 20th century in 1999, and the 67th Southern Region Convention held at the Radisson Riverfront Hotel, March 7-10, 2002. The name of Alpha Phi Alpha Fraternity, Inc, Alpha Chi Lambda Chapter is renowned in the CSRA. The chapter is home to 20 life members, numerous retired educators and outstanding businessmen, retired military, and up and coming professionals. Though small in size, the chapter is big in heart and in service. · Brothers Tutt, Griggs, and Blakely have schools named in their honor. · The Commission Chamber is named in honor of Brother Lee Beard. · The Brigham Community Center bears the name of Brother Henry Brigham. · Jenkins Memorial A.M.E. Church is named after Brother Solomon Jenkins. · Brother Judge John Ruffin served on the Court of Appeals and the courthouse is named in his honor. · The Bert Thomas Head Start Center at the “Y” is named after the current chapter parliamentarian. · Brother Ed McIntyre was the first black Mayor of Augusta. · Brother Charles Walker served as Senate Majority Leader. · Brothers Joe Scott and Johnny Jackson served on the School Board. · Brother Dr. Willie Mazyck served as Deputy Superintendent of Richmond County Schools. · Brother Dr. Dana Bedden served as Superintendent of Richmond County Schools. Regardless of fame or fortune, the men of Alpha Chi Lambda have united under the theme, “Not All Great Men Are Alphas, But All Alphas Are Great Men,” and understood that goodwill has always been the monarch of this House.